PHOTO BY PAT GAIETTO Calvert's Trenton Cooper gets by Monroeville's Skylar Scheid for a touchdown Saturday in Tiffin. As welcome-back gatherings go, Calvert really knows how to throw a party. Steve Reser, a 1995 Calvert graduate and football veteran, is back on the sideline as coach of the Senecas. And the return-to-roots bash was as big as they get. It’s safe to say Jones did his part with 210 yards on 14 carries and four touchdowns. Then there was Nic Somodi. Somodi had perhaps the turning point play in a game that was deceivingly close midway through the third period. Monroeville had just scored to trim Calvert’s lead to 30-27, but Somodi ripped off a 79-yard kickoff return for a touchdown and the Senecas were on their way. And the list of supporting cast members is a lengthy one. “That was very enjoyable there at the end,” Reser said. “There were times in the first half when the game got a little sticky. We started to separate a little bit but then we let them back in it. By night’s end, everything was showing on the scoreboard. Trent Cooper, who had a couple starts last year for injured Park Hemminger, is fully in charge at quarterback now and his 46-yard keeper put the Senecas on the board first just four minutes into the game. Cooper finished with 97 yards on 11 carries with a couple of scores. He also hit 8 of 14 passes for 107 yards. The defense got the next score as Nick Krajewski picked off Chayce Schaub’s pass and raced 39 yards to give Calvert a 14-0 lead. But as Reser said, things got a little jumpy from there. For Monroeville, Isaiah Scheid scored a touchdown with a 7-yard run and almost got another from 16 yards out. He fumbled at the goal, but teammate Roger Smith pounced on it in the end zone. That made it 22-12, Calvert, with the Senecas’ third score coming on Jones’ 30-yard sprint. 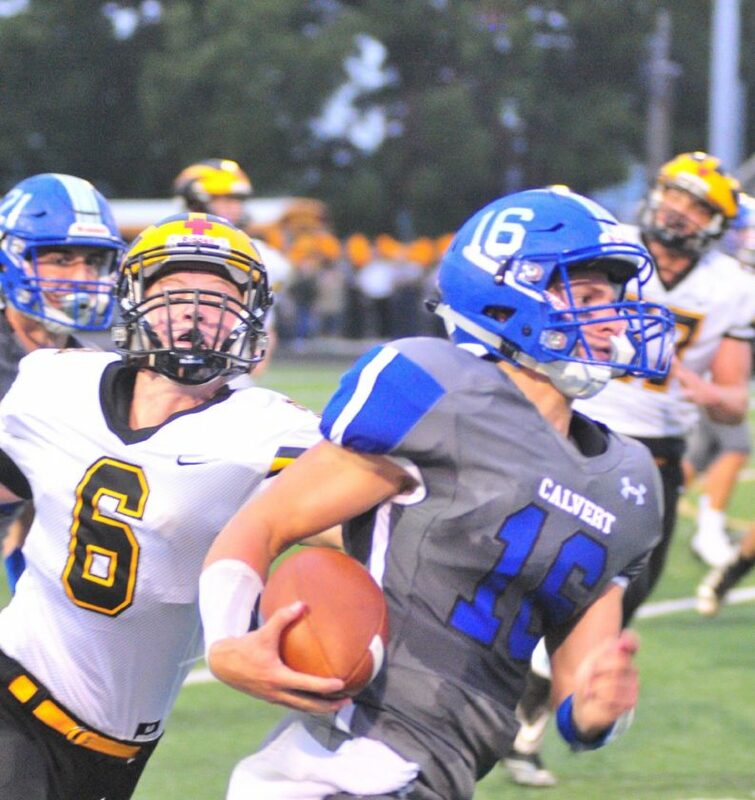 Still, it became a 22-19 game at the half as the Eagles’ Dominic Ruffing, who finished with 213 yards on 26 carries, scored on a 17-yard burst. Cooper’s 4-yard keep capped a 57-yard scoring drive to open the second half, but the Eagles trimmed it again to three points at 30-27 as Noah Smith recovered a muffed punt and Rogers ran 27 yards. Momentum Monroeville, but only for 14 seconds. Somodi picked up the ball on the kickoff at the 21 and raced to the end zone and the margin was back up to 38-27 with 4:56 still to play in the third period. Monroeville then fumbled the next kick and the Senecas were back on the board with Jones’ 6-yard run. Jones, who was limited to 30 yards on five carries at halftime, hit touchdowns of 79 and 57 yards down the stretch to turn the game into a rout. “They hit us with a lot of big plays. That’s a big-play team,” Monroeville coach Steve Stecher said. “They have athletes with the running back, quarterback and a couple receivers. They have four talented athletes that in space, can burn you. When they did, it was welcome-back party time at Frost-Kalnow.